The Red Grouper was recaptured on January 14th, 2016 by angler Laura Scott while fishing with the same boat, the Gulfstream IV and Captain Dan Bursma and mate Ray Tardiff, out of Key West, FloridaThe Red Grouper was at liberty in the water for 43 days until its recapture in the water around Key West, Florida. 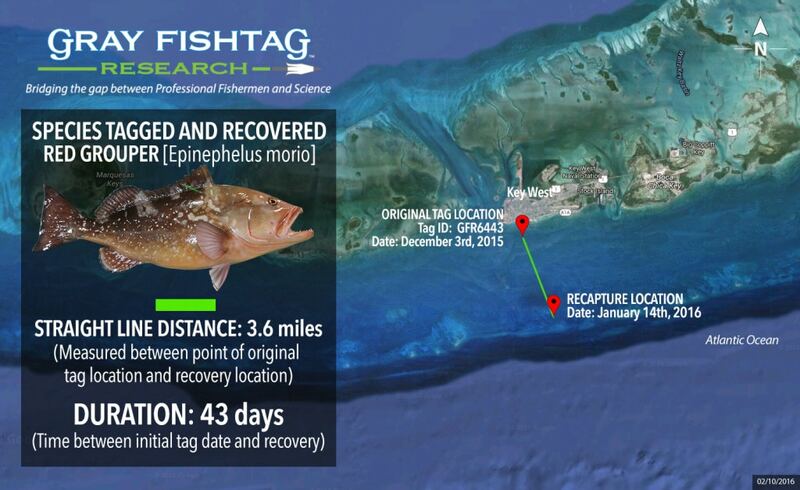 The tag recovery location was approximately 3.6 miles away from the tag deployment location. During that 43 day time period, the fish most likely stayed within the same local coral reef area, moving from a shallower hard bottom to a slightly deep reef at the time of recapture. 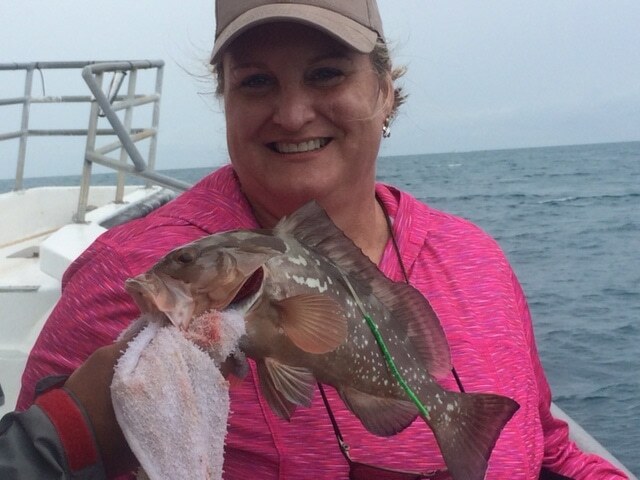 At recapture, the Red Grouper had a total length estimate of 17 inches and weight of 4 pounds, which showed no change in fish size. Red Groupers are dark brownish red color with a lighter color underneath. They exhibit blotches in an unorganized pattern on their sides and have a mouth lining that is scarlet orange. Red Groupers are bottom dwellers that are associated with muddy or rocky hard bottom habitats. The Red Grouper, like many other groupers, is a protogynous hermaphrodite, which means that they are all female when life begins. Most of them will transform to males between the ages of 7 and 14 years, or around 29 inches in length. The Gulfstream IV charter boat crew will receive some Gray FishTag gear for their tagging efforts. Angler Laura Scott will receive a pair of Costa Del Mar sunglasses, a Tag Recovery Certificate, and Gray FishTag gear for reporting the tag recovery.